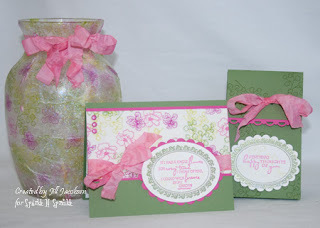 I have a class designed for you to make this beautiful gift trio for a special someone in your life. You will leave with a hand decorated vase, a coordinated gift box to fill and a card. You will be one of the first to use a new stamp set named Thoughtful Frames. This class is full of different techniques one of which is learning to dye your own ribbon with Copic Various Inks. looks like a class I would take if was on a Friday or Saturday. Sorry I have to miss it.